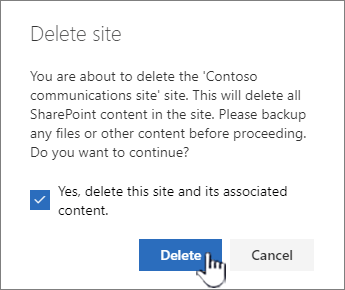 When you no longer need a SharePoint site or subsite, such as one created for a completed project, you can delete it to free up space. 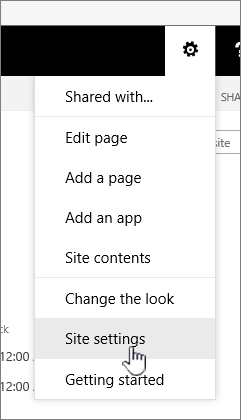 To delete a site or subsite in SharePoint Online or SharePoint Server, you must have admin or Full Control permissions. Note: If you don't have this permission level, talk to your site administrator or manager. See Understanding permission levels in SharePoint. 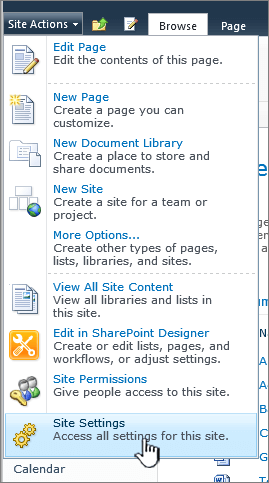 If you're not sure which version of SharePoint you're using, see Which version of SharePoint am I using?, or ask your administrator. Experienced with SharePoint? See Delete a site or subsite quicksteps below. Note: When you delete a site, you also delete any subsites, content, and user information that are part of the site, including documents, document libraries, lists, and list data. If you delete a group connected to a team site, you also delete the Office 365 group that is associated with it. Navigate to the group-connected team site or communication site you want to delete. Note: When you delete a team site, it also deletes the Office 365 group that is connected with the site. Click Settings at the top of the site and then click Site information. At the bottom of the Edit site information panel, click Delete site. 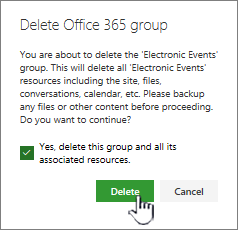 For team sites, in the Delete Office 365 group pane, confirm that you want to delete the Office 365 group and the associated site or files, and click Delete. 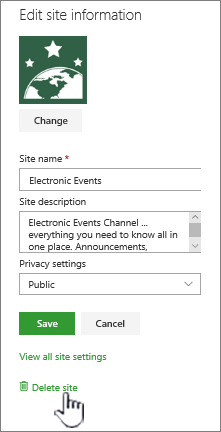 Note: When you delete a group connected team site, there can be a delay before the site is removed from SharePoint. For communication sites, in the Delete this site dialog box, click Delete. Caution: When you delete a site, you also delete any subsites, content, and user information that are part of the site, including documents, document libraries, lists and list data. You need to have Full Control permissions to delete a site or subsite. If you don't have this permission level, talk to your site administrator or manager. See Understanding permission levels in SharePoint. Navigate to the site or subsite you want to delete. Click Settings at the top of the site or subsite, and click Site settings. Click Delete this site under the Site Actions heading on the Site Settings page. 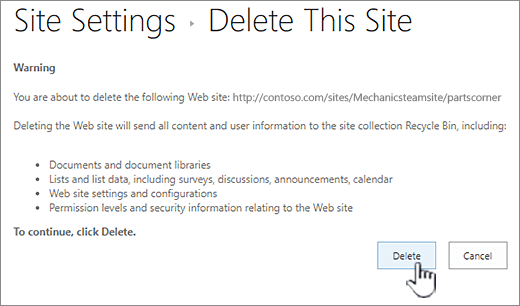 Note: If Delete this site doesn’t appear on the Site Settings page, you may not have permission to delete this site, or you're trying to delete a top-level site that's connected to an Office 365 group. On the Delete This Site page, verify that you are deleting the correct site, and then click Delete. Navigate to the team site you want to delete. Click Settings and then click Site Settings. If you don't see Site settings, click Site information and then click View all site settings. 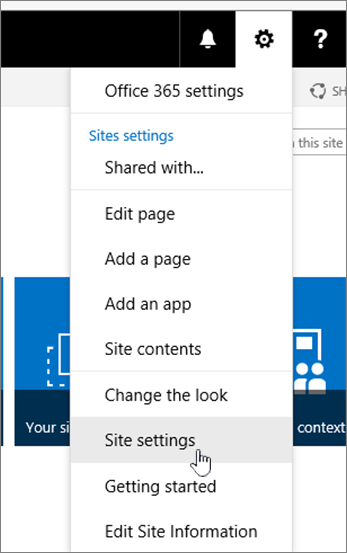 Some pages might require you to select Site contents and then Site settings. Note: If Delete this site doesn’t appear on the Site Settings page, you may not have permission to delete this site. On the Delete This Site page, verify that you are deleting the correct site and then click Delete. Note: When you delete a site, you also delete any subsites, content, and user information that are part of the site, including documents, document libraries, lists and list data. Navigate to the communication site you want to delete. If you're sure you want to delete the site, check the box and select Delete. Note: When you delete a site, you also delete any subsites, content, and user information that are part of the site, including documents, document libraries, lists, and list data. Navigate to the subsite you want to delete. If you're sure you want to delete the site, select Delete. When you delete a site, you also delete any subsites, content, and user information that are part of the site, including documents, document libraries, lists and list data. Note: You need to have Full Control permissions to delete a site or subsite. If you don't have this level, talk to your site administrator or manager. See Understanding permission levels in SharePoint. Click Settings at the top of the site or subsite, and then click Site settings. 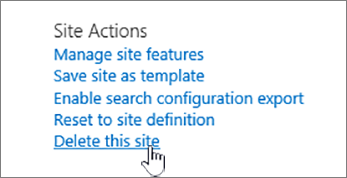 If you're using SharePoint Server 2010, click Site Actions and then click Site Settings. 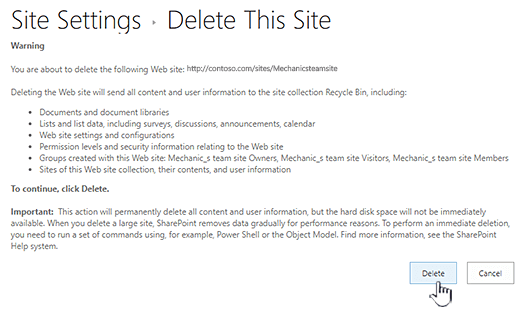 If you're experienced with SharePoint, here's how to delete a site or subsite in any version. Deleted a site by accident? 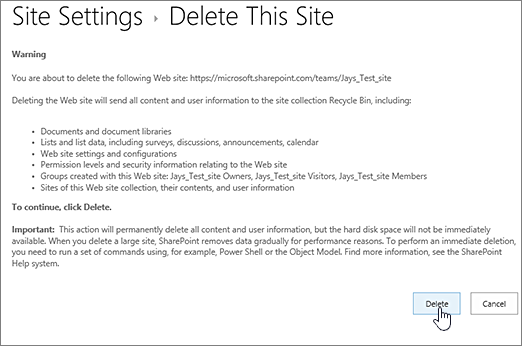 If you accidentally delete a site in SharePoint, it can usually be restored from the site collection recycle bin by a site collection administrator. See Restore deleted items from the site collection recycle bin. Looking for info on groups, deleting lists, libraries, documents, and permissions?